Veterans Learn to Code with the Help of Code Platoon - Enova International, Inc.
Code Platoon was the brainchild of two personal paths intertwining at just the right moment to create a solution for unemployed veterans in the Chicagoland area. Years ago, I was looking to make a career change and wanted to develop my skills in coding. I enrolled in an intensive boot camp that taught me everything I needed to know to start my career in a short 16-week program. Shortly after I completed the program, I was working as a junior coder and making a very comfortable salary at an entry-level job. I was transfixed by the transformative power of this model. While not a veteran myself, I have always been passionate about helping the veteran community. About a year into working as a coder, I came to recognize two things: there always seemed to be a need for new coders and many veterans were in search for employment. In fact, the average unemployment rate among veterans 20 – 35 years old is 9.1%, whereas non-veterans in the same age range is only 6.2%. Moreover, there are over 100,000 available software developer positions.1 It was clear to me that something could (and should) be done to fulfill the two needs. This is how our 501(c) 3 non-profit, Code Platoon began. At a high level, Code Platoon’s mission is to provide technical training and career placement to help veterans transition into the civilian workforce. However, we are so much more than that. Coding boot camps, much like the one I used to launch my career, can cost upwards of $10,000. Code Platoon acquired sponsors to help defray the costs of tuition down to $1,500, a built-in scholarship saving veterans 85%. Tuition costs also cover job counseling, interview preparation and other benefits for our students. Code Platoon sponsors, such as Enova, not only provide monetary support, but also provide the opportunity to interview for internships and mentorship for the second phase of our program: corporate opportunity. After students complete our 16-week intensive course, they are hired for a 3-month internship or apprenticeship with one of our sponsors. This allows our students to apply the skills they have learned in a real corporate environment and immerse themselves in the day-to-day life of a developer. At the conclusion of their internship, our students walk away with formal training, on-site training and priceless connections with corporate mentors. Using this model, we see approximately 50% of our students stay with the company of their internship and the other 50% finding other opportunities elsewhere very quickly. 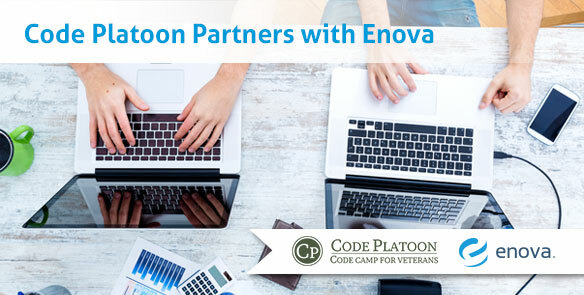 Code Platoon began working with Enova about one year ago after a chat with CEO, David Fisher. David was strongly supportive our mission and was eager to get involved. Our pilot cohort of nine students began class on February 1st, finishing our program toward the end May. Students will begin interviewing for internships with our corporate sponsors in early June. We are very excited to be working with all of our sponsors, including Enova, and look forward to seeing the success of our students in the coming months. If you’d like to donate, become a sponsor or learn more about the program, please visit our website.